In the modern American economy those with relatively little education (immigrant or native) earn modest wages on average, and by design they make modest tax contributions. Because of their relatively low incomes, the less-educated, or their dependent children, are often eligible for welfare and other means-tested programs. As a result, the less-educated use more in services than they pay in taxes. This is true for less-educated natives, less-educated legal immigrants, and less-educated illegal immigrants. There is simply no question about this basic fact. The relationship between educational attainment and net fiscal impact is the key to understanding the fiscal impact of immigrants, legal or illegal. Research that has focused on immigrants' net fiscal effect shows exactly what one would expect: on average those who have not completed high school and those with only a high school education are a significant net fiscal drain, while those with at least a college degree are, on average, a significant net fiscal benefit. In the case of illegal immigrants, the vast majority of adults have modest levels of education, averaging only 10 years of schooling. This fact is the primary reason they are a net fiscal drain, not their legal status. It must also be understood that use of welfare and work often go together. Of immigrant-headed households using welfare in 2011, 86 percent had at least one worker during the year. The non-cash welfare system is specifically designed to help low-income workers, especially those with children. There are also a number of other programs that provide assistance to low-income workers, such as the Earned Income Tax Credit and the cash portion of the Additional Child Tax Credit. Because low-income workers and their families can and do access welfare and other means-tested programs, and because they are taxed a relatively low levels, it is very common for a worker, even a full-time worker, to be a significant a net fiscal drain. We may decide to amnesty illegal immigrants and/or continue to admit large numbers of less-educated immigrants through family-based immigration or a new foreign worker program. If we do this, however, we should at least be honest with the American people, making it clear that such policies have a sizable negative impact on taxpayers. It is important not to see this situation as a moral failing on the part of the less-educated (immigrant or native); rather, it simply reflects the realities of the modern American economy, coupled with the existence of a well-developed welfare state. In my view, immigration policy should reflect this reality. Updated to 2013 dollars the NRC net lifetime fiscal drain for an immigrant with less than a high school education would be -$132,000 while the drain for an immigrant with only a high school education would be -$46,000. Figure 1 at the end of this testimony illustrates the importance of education. For example, it shows that 59 percent of households headed by immigrants who have not graduated high school access one or more welfare programs, and 70 percent have no federal income tax liability. In contrast, 16 percent of households headed by an immigrant with bachelor's degree access welfare and only 21 percent had no federal income tax liability. 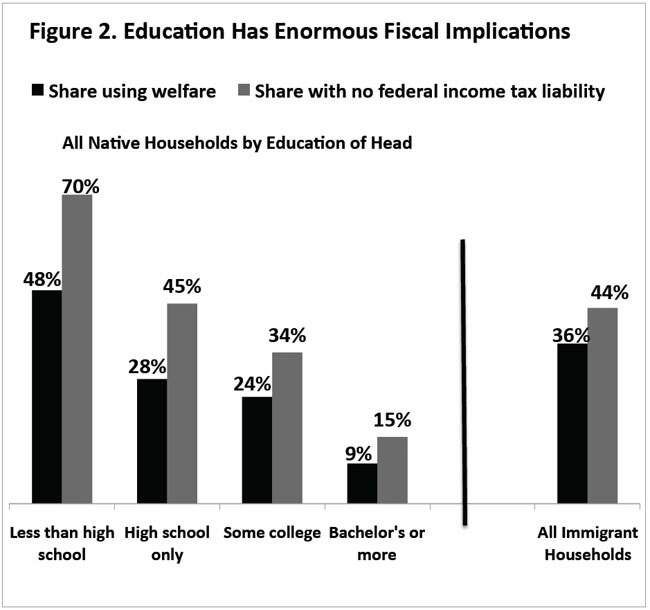 Figure 2 shows welfare use and tax liability for native-headed households by education level. Like Figure 1, the results in Figure 2 show the enormous implication of education when thinking about fiscal impacts. Table 1 provides additional information by education and length of residence in the United States. It shows that a large share of less-educated immigrants struggle in the United States in terms of income, poverty, health insurance coverage, welfare use, or language ability. This is the case even when they have lived in the country for 20 years. The table also shows that immigrants with a bachelor's degree generally do quite well in the United States. Even newly arrived well-educated immigrants generally prosper. 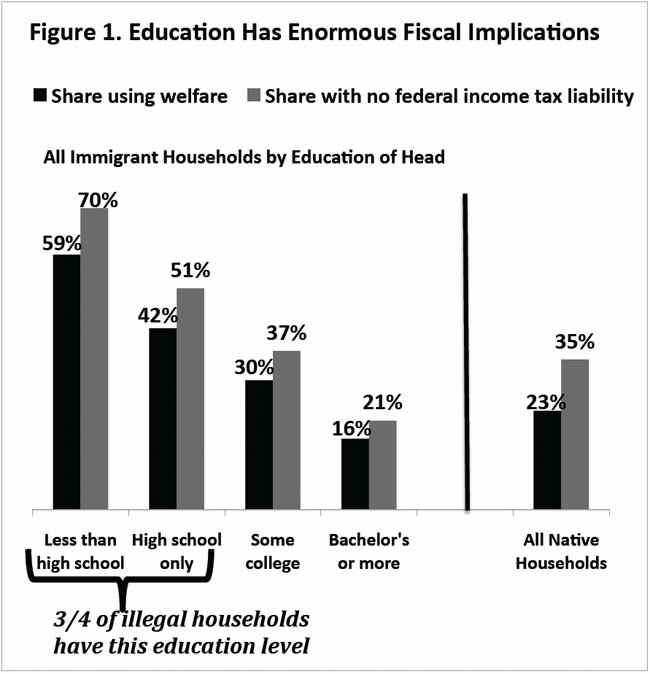 Illegal immigrants with little education are a significant fiscal drain, but less-educated immigrants who are legal residents are a much larger fiscal problem because they are eligible for many more programs. For this reason amnesty increases costs in the long run. There is a pretty clear consensus that the fiscal impact of immigration depends on the education level of the immigrants. Certainly other factors also matter, but the human capital of immigrants, as economists like to refer to it, is clearly very important. There is no better predictor of one's income, tax payments, or use of public services in modern America than one's education level. The vast majority of immigrants come as adults, and it should come as no surprise that the education they bring with them is a key determinant of their net fiscal impact. Advocates of amnesty and allowing in large numbers of less-educated immigrants have three main responses to the above analysis. First, they argue that less-educated immigrants are no worse in terms of their net fiscal impact than less-educated natives. Second, they argue that examining households overstates the costs because it includes the U.S.-born children of immigrants. Third, they argue that less-educated immigrants, and immigrants generally, create large economic benefits that offset the fiscal costs they create. As will be discussed below, none of these arguments holds much water. Claim: "Less-educated immigrants are no worse than less-educated natives." As I have emphasized in the discussion above, and as the figures and table below make clear, both less-educated natives and less-educated immigrants are likely to be a significant fiscal drain. But this observation is largely irrelevant to the immigration debate. What matters is the actual fiscal impact of immigrants, not whether that impact is similar to similarly-educated natives. Immigration is supposed to benefit the country. As a sovereign country we have a right to select well-educated immigrants if we think that makes sense for our country. We also have a right to enforce our law against illegal immigration. In contrast, less-educated natives are here and it is their birthright to remain. Their low income or high use of welfare is certainly a concern. But common sense suggests that we do not want to add to the concern through immigration. Put simply, the fiscal drain created by less-educated natives does not in any way justify allowing into the country less-educated immigrants. Of course, there may be other arguments to allowing in less-educated immigrants. Claim: "Children should not count." Advocates for high immigration often object to doing analysis by households because it includes the U.S.-born children of immigrants. They argue that the costs for education, welfare, and other programs that benefit children should not be counted because these children are not immigrants. (More than 80 percent children in immigrant households are U.S.-born.) Of course such an argument ignores the fact that the children would not be here but for their parents having been allowed into the country. Further, the critics argue that someday the child will grow to adulthood and pay back these costs. This may or may not turn out to be true, but it does not change the very real costs created in the present. First, the NRC study cited above did individual level analysis, excluding U.S.-born children, and still found a large fiscal drain if the original immigrant arrived without a high school education or with only a high school education. In other words even without the children, there was still a significant net fiscal drain from less-educated immigrants. Support for a household-level analysis is very common among academics. The National Research Council states that the "household is the primary unit through which public services are consumed and taxes paid" in their analysis of the fiscal impact of immigrants. In their study of New Jersey, Deborah Garvey and Princeton University professor Thomas Espenshade also used households as the unit of analysis because, as they pointed out, "households come closer to approximating a functioning socioeconomic unit of mutual exchange and support. "9 Harvard University professor and labor economist George Borjas and economist Lynette Hilton, in their 1996 study of immigrant welfare use also examined households.10 The Census Bureau itself has reported welfare use for immigrants and natives by household.11 Household-level analysis makes sense because a child can only be enrolled in Medicaid or free/reduced school lunch if the total income of his or her family or household is below the eligibility threshold. Moreover, many welfare benefits can be consumed by all members of the household such as food purchased with food stamps. Finally, it must be pointed out that if the critics are correct — that children should not count — then the same must be true for native-headed households. But if programs and benefits that go to children are excluded, a large share of the federal current budget deficit does not exist. Similarly, if education is not counted then most state and local governments are flush with money. Of course, such a conclusion is total nonsense. Taxpayer money spent on children is real and significant. Suggesting that money spend on the children of immigrants or children generally should not be counted as real costs is completely contrary to common sense. This type of argument only obscures the issue and not is unhelpful when thinking about the costs and benefits of immigration. Claim: "Economic benefits offset Fiscal Costs." This argument takes several forms but the idea is that immigration increases the income of natives and this offsets the fiscal costs immigration creates. The National Research Council study mentioned above is the only study of which I am aware that tried to measure both the economic and fiscal impact of immigration. That study concluded that the economic gain to the native-born, which is referred to by economists as the "immigrant surplus", was $1 billion to $10 billion a year in 1996. At the same time the NRC estimated that the net fiscal drain (taxes paid, minus services used) from immigrant households was negative $11 billion to $20 billion a year. Thus, there was an economic benefit, but it was smaller than the fiscal drain. While advocacy groups have tried to argue otherwise, there is simply no objective research indicating that immigration creates significant economic gains for natives. Recently some immigration advocates have argued that the Gang of Eight immigration plan will result in significant net gains for public coffers based on the idea of "dynamic scoring" or "dynamic analysis." Chief among them has been Sen. John McCain's (R-Ariz.) former economic advisor, Douglas Holtz-Eakin. Holtz-Eakin laid out his argument in an opinion piece published by the American Action Forum, which he heads.12 He also recently testified before this very committee. I have provided a much longer critique of his arguments elsewhere.13 Below I touch on some the main problems with his formulation. Probably the biggest weakness of his analysis is that he ignores the actual characteristics of immigrants, generally, and illegal immigrants in particular, factors that bear directly on their fiscal impact. This includes relatively high poverty, welfare use, lack of health insurance, and their more modest tax payments (See Table 1, below). Holtz-Eakin even ignores the research indicating that the education level of immigrants at arrival has direct bearing on their income, tax payments, use of public services, and their resulting net fiscal impact. The above-mentioned NRC study came to the same conclusion as Borjas — immigration's main impact is to redistribute income. The study estimated that the economic benefit from the redistribution created by immigration was at most $10 billion, one- to two-tenths of 1 percent of GDP at the time of the study. This is very similar to the Borjas estimate and it is very far from the kinds of per capita gains Holtz-Eakin asserts in his article. In addition to ignoring the immigration research, Holtz-Eakin also ignores the literature that looks at the impact of population growth on per capita income in developing countries, which would appear to be directly related to his argument. That research generally does not support the idea that by itself population growth increases per capita GDP. A 2009 review of 29 different studies on the impact of population growth on economic development concludes: "Particularly strong is the evidence in support of the increasingly adverse effects of population growth in the post-1980 period. "15 Maybe he feels that this work is not relevant to developed countries like the United States. But he does not say so. If you take nothing else away from my testimony, it should be remembered that it is simply not possible to fund social programs by bringing in large numbers of immigrants with relatively little education. 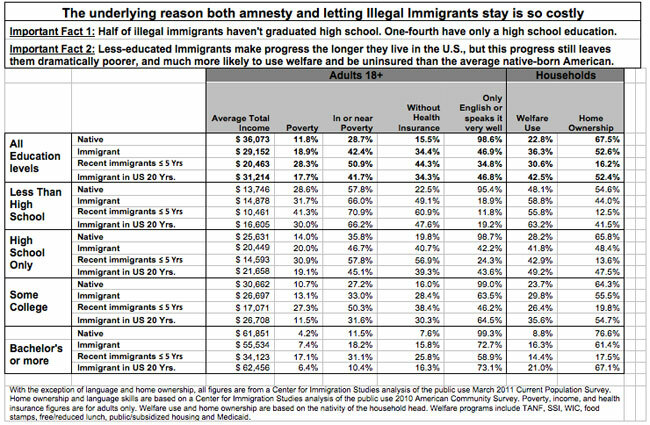 This is central to the debate on illegal immigration given that such a large share of illegal immigrants have modest levels of education. The fiscal problem created by less-educated immigrants exists even though the vast majority of immigrants, including illegal immigrants, work and did not come to America to get welfare. The realities of the modern American economy coupled with the modern American administrative state make large fiscal costs an unavoidable problem of large-scale, less-educated immigration. This fact does not reflect a moral defect on the part of immigrants. What it does mean is that we need an immigration policy that reflects the reality of modern America. We may decide to let illegal immigrants stay and we may even significantly increase the number of less-educated legal immigrants allowed into the country. But we have to at least understand that such a policy will create large, unavoidable costs for taxpayers. Source: Public-use file of the March 2011 Current Population Survey. Welfare programs include SSI, TANF, food stamps, WIC, free lunch, public/subsidized housing and Medicaid. Jeffrey S. Passel D'Vera Cohn, "A Portrait of Unauthorized Immigrants in the United States", Pew Hispanic Center, 2009. See also Steven A. Camarota, "Immigrants in the United States, 2010: A Profile of America's Foreign-Born Population", Center for Immigration Studies, 2012. 2 The National Research Council's 1997 report is report entitled, The New Americans: Economic, Demographic, and Fiscal Effects of Immigration. A summary of the report's findings can be found here. 3 See end note 2. 4 Robert Rector and Christine Kim, "The Fiscal Cost of Low-Skill Immigrants to the U.S. Taxpayer", Heritage Foundation, 2007. 5 Robert Rector, Christine Kim and Shanea Watkins, Ph.D., "The Fiscal Cost of Low-Skill Households to the U.S. Taxpayer", Heritage Foundation, 2007. 6 Steven A. Camarota, "The High Cost of Cheap Labor Illegal Immigration and the Federal Budget", Center for Immigration Studies, 2004. 7 See end note 6. 8 Julian L. Simon, "Immigrants, Taxes, and Welfare in the United States 1984", Population and Development Review, Vol. 10, No. 1 (March, 1984), pp. 55-69. 9 "State and Local Fiscal Impacts of New Jersey", in Keys to Successful Immigration: Implications of the New Jersey Experience, Thomas J. Espenshade, ed., Washington, DC: Urban Institute Press, p. 143. 0 George J. Borjas and Lynette Hilton, "Immigration and the Welfare State: Immigrant Participation in Means-Tested Entitlement Programs", Quarterly Journal of Economics, May 1996. 1 The Census Bureau reports welfare use by household based on the nativity of the household head. See, for example, Figures 20-1, 20-2, and 21-3 in "Profile of the Foreign-Born Population: 2000", U.S. Census Bureau, December 2001, pp. 23-206. 2 Douglas Holtz-Eakin, "Immigration Reform, Economic Growth, and the Fiscal Challenge", April 2013. 3 Steven A Camarota, "Dynamic Scoring of Immigration? A Critique of Douglas Holtz-Eakin's Analysis", Center for Immigration Studies, 2013. 4 See " Immigration and the American Worker A Review of the Academic Literature", Center for Immigration Studies, 2013. 5 Derek D. Headey and Andrew Hodge, "The Effect of Population Growth on Economic Growth: A Meta-Regression Analysis of the Macroeconomic Literature", Population and Development Review, Vol. 35, No. 2, 2009.